Ever since Esther Solar's grandfather was cursed by Death, everyone in her family has been doomed to suffer one great fear in their lifetime. Esther's father is agoraphobic and hasn't left the basement in six years, her twin brother can t be in the dark without a light on, and her mother is terrified of bad luck. The Solars are consumed by their fears and, according to the legend of the curse, destined to die from them. Esther doesn't know what her great fear is yet, nor does she want to, a feat achieved by avoiding pretty much everything. Elevators, small spaces, and crowds are all off limits. 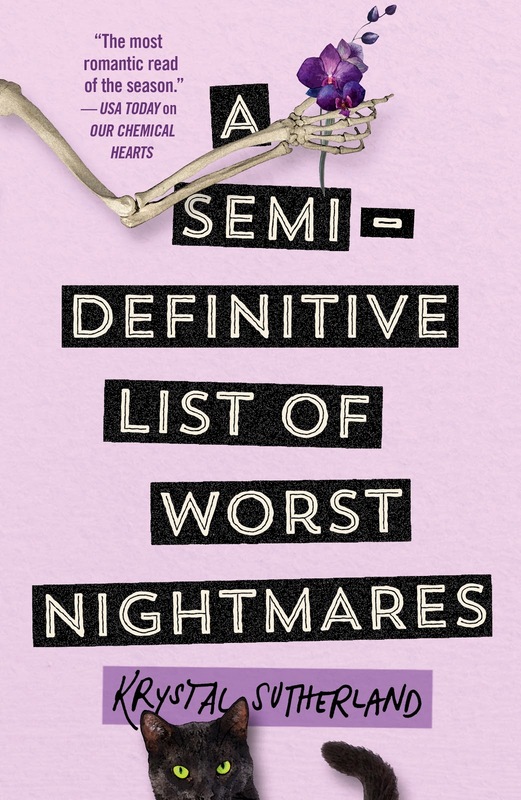 So are haircuts, spiders, dolls, mirrors and three dozen other phobias she keeps a record of in her semi definitive list of worst nightmares. Then Esther is pickpocketed by Jonah Smallwood, an old elementary school classmate. Along with her phone, money and a fruit roll up she'd been saving, Jonah also steals her list of fears. Despite the theft, Esther and Jonah become friends, and he sets a challenge for them. In an effort to break the curse that has crippled her family, they will meet every Sunday of senior year to work their way through the list, facing one terrifying fear at a time, including one that Esther hadn't counted on. Love. Esther Solar is predestined to be cursed. Her brother is afraid of what dwells within the shadows, her father confined to the basement by anxiety while her mother squanders their meagre possessions to finance her addiction. Grandfather Reginald Solar was a young man during the Vietnam war when he encountered Jack Horowitz, a young soldier recruited to become the reaper and now their lives will subsequently succumb to their fears. Esther is an eccentric, luminous young woman and an entrepreneur, selling baked delicacies to the teaching and student faculty to finance her escape from the small, podunk town. It's inevitable that Esther too will be consumed by fear. Until Jonah. Jonah Smallwood is a charlatan, an opportunistic young man who has retracted to the nondescript town where he now lives with his alcoholic father and sister. After discovering Esther's list of Worst Nightmares, Jonah challenges Esther to confront her anxiety. I really enjoyed the adventure of Esther's challenges and the encouragement Jonah provided within their tentative friendship and the acceptance of Esther's family. The familial relationships were interesting. Esther often referred to her mother as an enchanting presence in their lives but now neglects her children, frequently selling their meagre possessions to finance her addiction. Her father is a former veterinarian and now agoraphobic, living within the basement of the family home where his wife and children no longer visit. Esther has a wonderful relationship with brother Eugene, a lovely young man incapacitated by the darkness and monsters who dwell within the shadows. Consumed by her own journey, Esther often neglected Eugene's distress. Although Esther is anxious, I admired her bravery but sensed she distanced herself from her family's predicaments, often appearing to be ignorant. I enjoyed the overall narrative but found issues with the portrayal of suicide and dialect chosen for characters. In particular, Esther. Ugh. Sink the scalpel a little deeper next time, oh wise and annoying one. Although it was remarked as banter, it's incredibly insensitive and may perturb readers who have been diagnosed with a mental health disorder. It changed my perception of Esther and her familial relationships. I was concerned that Esther herself was unable to acknowledge she was unwell, her perception of the addiction and mental illness of her family members manifesting as a curse rather than their distress and disorder. The diverse character representation was wonderful. Jonah is black, friend Hephzibah is a selective mute of Israeli heritage, her father is a stroke survivor and her grandfather has been diagnosed with dementia. Characters also experiencing addiction and family violence. Although a #LoveOzYA read, the narration takes place within a nondescript American town. A Semi Definitive List Of Worst Nightmares is an entertaining and charismatic read but not without nuisance. I'm glad there was a lot of diversity, and some great characters. I am saddened that you didn't feel the topic of suicide was handled as well as it could have been. Mental illness is a delicate topic, and it's not always done well. Overall it was a great read but towards the end I thought the character dialogue was incredibly insensitive in regards to a character's suicide attempt. Even said in jest, I think making jokes about sink the scalpel a little deeper next time is just insensitive and could be triggering for some readers. Which is a shame. It's unique and widely praised for the mental illness representation and I agree. Mostly. It was still a great read nevertheless Lily, I would love to see what you think of it. I'm glad you liked this one Kelly! Sad about that quote though, especially since I heard that the book handled the mental illness aspect quite well. I think one of the reasons why I don't feel like picking this up is because it doesn't seem quite up my alley. And then I also read the author's other book last year, Our Chemical Hearts, and ultimately liked it, but didn't absolutely love it. So I'm still unsure how I feel about this, but I'm glad to see that it does feature some diverse characters. That's always nice to see! It was an entertaining read but I felt similar as you had with My Chemical Hearts. Esther and her inability to acknowledge mental illness and addiction annoyed me once she started the flippant discussion about suicide. This premise!! Ahh!!! I'm a sucker for any book that includes death as a character, & even more so when there's some sort of family curse/disease that must be broken/cured, so this one sounds right up my alley <3 I'm so glad you enjoyed it, dear Kelly -- thank you so much for introducing me through your lovely review! I'm going to pick it up ASAP; it sounds wonderful. A girl after my own heart Topaz. I always navigate towards reads with death portrayed a tangible character too. Really interested to see what you think of this one. I know this author had some stuff around her first book be described as problematic, but I was at the launch for this and thought she was a hit! Seems like the book is quite good, and I like the focus Esther's anxiety. As well as the diversity. I hadn't heard about that Verushka. It's a great read, just a little insensitivity from Esther unfortunately. Thanks Vanessa, would love to see what you think of it. It was still a wonderfully entertaining read Karen, just Esther's attitude irritated me and some may find her insensitive. Hmmm this one sounds interesting, but I don't like that quote. And I know one cannot judge something by a single line out of context, but the fact it's flippant about suicide is gross to me. The narrative needed much more cat as well. You can never have enough cute animals in fiction. The single line was said by the main character in Esther towards the character who had tried to kill themselves. Even said in jest it was just incredibly insensitive. I've heard great things about this one so hearing that there are actual flaws to the read is good, it tempers my expectations. It sounds like a strange read and I will still pick it up, even if some of the language used maybe insensitive because it sounds interesting. I love that it's a diverse read addressing mental health so hopefully it will be good. I think you'll really enjoy this one Becky, I did for the most part but was disappointed towards the end. Really looking forward to seeing what you think of it. Yeah, I don't think you would probably enjoy this one Ailyn unfortunately. Although entertaining, Esther can be quite frustrating. Just a throwaway conversation really Sarah but that line in particular I found really insensitive. It's a difficult one to review. So many readers have found the mental illness wonderfully represented and I did apart from the main character in Esther. It felt as though she wasn't willing to acknowledge the illness and addiction, even her own mental health. She herself is reluctant about counselling and it could have been a wonderful learning curve for her character but never acknowledged again. Would really like to see how you feel about it too. Lovely review. The title is definitely striking. I am glad the representation was done well. Sorry that the dialogues seemed a bit clunky. Thanks Resh. It was a great read overall, really entertaining. The premise for this one sounds unique. I'm sorry it didn't work out quite as well as you'd hoped for you. Great review!